Vermont Housing Finance Agency (VHFA) has issued a Request for Proposals to provide underwriter services for VHFA’s bond issuance. The details of the RFP can be found on our website. The deadline to submit a proposal is Friday, January 4, 2019. Proposals and questions should be directed to finrfp@vhfa.org. We will be posting your questions related to the RFP, and our answers, on the RFP page. New estimates from the ACTION Campaign demonstrate the significant impact that the Low-Income Housing Tax Credit has had in Vermont, including creating and preserving over 7,000 affordable homes since 1986 and supporting nearly 8,000 jobs per year. The Low-Income Housing Tax Credit is the largest source of funding for publically-assisted housing development. These federal tax credits are awarded by the Vermont Housing Finance Agency (VHFA) to developers, who sell the credits to raise capital for construction. In exchange, developers set aside apartments for low-income households. These apartments are roughly affordable to households earning less than $40,000, for a family of four. The program has created over 3 million affordable housing units nationwide since it began in 1986. The program is also an important source of economic development for Vermont, generating $296 million in local income and $754 million dollars in tax revenue stemming from the construction of the homes. However, 39,000 Vermont households still pay over half their income towards housing costs. This makes it extremely challenging to afford other basic necessities like transportation, healthcare, childcare, and food. Most of the low-income households in Vermont do not receive housing assistance, from this or other housing programs. The ACTION Campaign (A Call To Invest in Our Neighborhoods) has released a fact sheet providing these figures. VHFA is a proud member of the campaign, which is a national coalition of over 2,200 national, state, and local organizations and businesses that have joined to call on Congress to protect and expand the Low-Income Housing Tax Credit. Currently, ACTION is supporting the bipartisan Affordable Housing Credit Improvement Act, which would expand the program by 50% over five years, as well as by providing states with additional flexibility in tax credit allocation, streamlining financing, assisting development in rural communities, and supporting the preservation of existing affordable housing. According to ACTION, a 50% increase to the program would allow 903 additional affordable homes to be built in Vermont over the next ten years. In addition to state fact sheets, ACTION provides a variety of resources to support advocacy, including letter-writing campaign materials, reports on pending legislation, and a list of other campaign members in Vermont. VHFA Executive Director Sarah Carpenter joined affordable housing partners in South Burlington last week to celebrate the completion of Allard Square. The project, developed by Cathedral Square Corporation and Synder-Braverman Development Company, created 39 one and two bedroom apartments for seniors, 29 of which will be rented at rates affordable to low income Vermont seniors. The project was funded in large part by federal tax credits and a loan awarded by VHFA. Allard Square is named for Doris Allard, a 94-year old who has lived Cathedral Square’s original apartment building for over 40 years. Allard cut the ceremonial ribbon to mark the new building’s official opening. 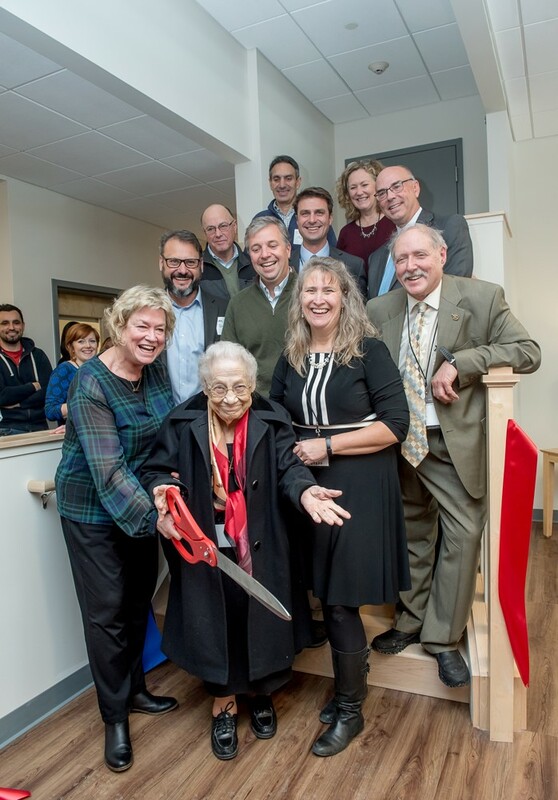 “It has been such a joy to support Cathedral Square in their creation of much-needed apartments and the SASH program for seniors throughout the state,” said Carpenter. All residents at Allard Square will have access to SASH (Support and Services at Home), a care-coordination program that helps residents live safely, comfortably, and independently. The energy efficient and accessible building features several community spaces and is within walking distance to shops and services in South Burlington’s emerging downtown center. Primary funding for the project was provided through federal housing credits awarded by Vermont Housing Finance Agency (VHFA), which were sold People’s United Bank to raise $6.7 million in equity and a $1.6 million long term loan to the project. Other funding partners included the Vermont Housing and Conservation Board (VHCB) with funding from the recent Vermont Housing Revenue Bond, the Vermont Community Development Program (VCDP), federal HOME program funds, the South Burlington Housing Trust, The TD Charitable Foundation, and the Harry & Jeanette Weinberg Foundation. There are vacancies in 34 different apartment complexes across the state, according to the Vermont Directory of Affordable Rental Housing. Learn more about particular units by clicking on the development name below, or by visiting the vacancy profiles on the website. New England Federal Credit Union (NEFCU) President/CEO John J. Dwyer, Jr. announced today a $500,000 grant from NEFCU to Vermont Housing Finance Agency (VHFA) to address the area’s shortage of housing affordable to Vermonters with low and moderate incomes. The money will support construction and renovation costs for perpetually affordable homes in Bristol, Jericho and several other towns. “This investment will help address the shortage of affordable housing in the area, which impacts not only our residents but also businesses and communities,” Dwyer remarked. “We believe that improving the affordability of homes in the counties we serve creates a cascade of benefits that help make the region more economically healthy in the long run,” he continued. NEFCU serves residents in Addison, Chittenden, Franklin, Grand Isle, Lamoille and Washington counties. In Bristol, the Pleasant Hills apartment complex is in need of major upgrades which the NEFCU grant will make possible. These apartments near downtown Bristol are home to 16 low-income senior households. Improvements will include replacement of major systems, energy efficiency upgrades to the envelope and accessibility improvements. Housing Vermont is partnering with the Addison County Community Trust to redevelop the property. “We are thrilled that residents of Pleasant Hills can be with us today,” remarked Sarah Carpenter, Executive Director of Vermont Housing Finance Agency. “The renovations funded in part through NEFCU’s grant will provide a safer and healthier environment and create an attractive, efficient and durable building that will benefit both residents and the community for years to come” she continued. The NEFCU grant will also help to construct two new perpetually affordable owner-occupied homes in Jericho. These homes will be part of a small, 6-home condominium complex on Morgan Road near Mount Mansfield Union High School. The NEFCU grant funding will help lower the sale prices of the two homes to roughly $160,000, making them affordable to households with lower incomes. Through Champlain Housing Trust’s shared appreciation program, the homes will remain affordable to lower income households in perpetuity. “The residential construction in Jericho will help bring much-needed homes into our regional housing stock,” explained Charlie Baker, Executive Director of the Chittenden County Regional Planning Commission. “Our housing market is so tight that it quickly absorbs new homes, especially those offered at lower price points,” Baker continued. This grant continues NEFCU’s bold steps toward helping the tens of thousands of lower income Vermonters who receive no housing assistance but face housing costs that are out of line with their income. In 2017, NEFCU provided a $1 million investment to VHFA for affordable housing. This grant has provided critical support to four affordable housing initiatives so far. The development of affordable apartments in the historic French Block building in downtown Montpelier, construction of apartments for seniors in South Burlington’s new City Center, a memory care facility in Williston and the financing of several new high-efficiency Vermod homes will create decent, perpetually affordable homes for 74 Vermont households in the region.